Preheat oven to 400 degrees Fahrenheit and prep an aluminum-foil-lined baking dish for the meatloaf. In a saucepan over medium heat, melt the butter then add the bell pepper, yellow onion, celery, and garlic. Sauté the mic for 3 to 4 minutes, until the onions are translucent. Add the Worcestershire sauce, Tabasco sauce, sea salt, black pepper, cayenne pepper, Cajun seasoning, and nutmeg to the mix. Stir to combine. Add 1/2 cup of ketchup to the mix. Stir to combine and slightly heat (approximately 1 minute). Remove the saucepan from the heat and allow the sauce to cool for 5 minutes. Once cool, add the breadcrumbs and stir until the mix forms a paste. In a separate large mixing bowl, beat the eggs then add the milk. Stir well. Add the ground pork and beef to the beaten eggs and knead the pork and beef to combine all ingredients. Add the vegetable mix to the meat and continue kneading to combine all ingredients. Transfer the meat to the foil-lined baking dish and evenly spread the meat into loaf form. Combine the remaining 3/4 cup of ketchup with 1 tablespoon of honey. Stir well, then evenly spread the ketchup over the top of the meatloaf. 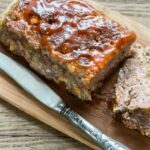 Bake the meatloaf for 35 to 40 minutes, or until the meat is thoroughly cooked. Remove from the oven and allow the meatloaf to cool for 5 minutes, then remove from the baking dish, slice, and serve. Want it spicier? Start with 1/4 to 1/2 teaspoon of cayenne extra in the meatloaf. You can also add a small amount of cayenne (a pinch or two) to the ketchup that tops the meatloaf.